In many instances, we can have your case dropped before charges are even filed. We can negotiate with the Prosecutor for drastically reduced charges. In the event of a conviction, we can persuade the court for more lenient punishment. The attorneys at Chappell, Lanehart, & Stangl work as a team, collaborating to bring more than 50 years of collective experience to build a winning strategy for your defense. When you seek our legal advice, we will fully explain the legal process controlling your case. When you leave our office after your free consultation, you will understand the charges and the consequences, and you will be confident your case is in good hands. Chappell, Lanehart & Stangl is one of the oldest criminal law firms in Lubbock, and boasts two specialists board-certified in the field of criminal law by the Texas Board of Legal Specialization—Chuck Lanehart & Fred Stangl. Our criminal defense attorneys are known for their aggressive pursuit of justice and for their commitment to zealous advocacy. 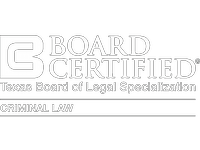 Chappell, Lanehart & Stangl focuses its practice on professional criminal defense for individuals and businesses. Our attorneys have built a stellar reputation in Lubbock and throughout Texas for top-notch criminal defense. We listen to what did and didn’t happen, ask pertinent questions, and assess the potential strength and/or weaknesses of the case. Compile a list of possible witnesses and statements concerning your case. Interview and question all parties concerned. Visit the scene of the arrest or alleged crime, combing for evidence while notating irregularities or conflicting information. Conduct a thorough background check of all potential witnesses and involved parties, looking for information helpful to your case. Hire a private investigator when applicable, to prove or disprove essential elements to your case. Evaluate the chain of events leading up to and resulting in your arrest and detention.